The Sun begins the month in the constellation of Aquarius but crosses the border into Pisces on the 12th at around 22h. It is climbing steeply now and daylight increases rapidly. On March 20th at 21h58 the Vernal Equinox occurs, when the Sun is directly overhead at the earth’s equator. The Sun-Earth distance at the time is 148,989,865 km. The astronomical season of Spring begins in the northern hemisphere, and lasts for 92.74 days. If the Earth had no atmosphere, day and night at this time would be exactly equal all over the planet except at the poles, but due to atmospheric refraction, this scenario occurs some days earlier. March is the best month to observe the mysterious Zodiacal Light during evenings when the moon is not present in the sky and you are well away from light pollution. Look towards the west when twilight has faded and you should see a faint cone of light pointing southwards at a steep angle of 60°. This year, the best time to observe the zodiacal light is from the 21st to the end of the month.. This phenomenon is caused by the Sun illuminating the disc of fine dust, which is the remnant of Solar System formation 4.5 thousand million years ago. The Moon is at perigee, its nearest to the Earth, at 20h00 on the 19th. It is at apogee, its furthest from the Earth, at 11h00 the 4th. New Moon is on the 6th at 16h05, in Aquarius, where it passes 5° south of the Sun. First Quarter takes place at 10h28 on March 14th in the constellation of Taurus, near the tip of The Bull’s southern horn and in the direction of M1, the Crab Nebula, It is the highest First Quarter Moon of the year. Full Moon is on the 21st at 01h43 in the constellation of Virgo; and about to enter the asterism known as the ‘Spring Triangle’. This consists of the stars Denebola (beta Leonis), Spica (alpha Virginis) and Arcturus (alpha Boötis). The latter star is the brightest of the stars in the North Celestial Hemisphere. This should be the Paschal Full Moon. However, it follows the Equinox by only three hours, and so this year it is the April Full Moon on the 19th which is referred to this year as the Paschal Full Moon. Last Quarter Moon, is on March 28th at 04h10 in the constellation of Sagittarius, midway between Jupiter and Saturn. Jupiter is the brighter of the two planets, to the right, and Saturn is on the left of the ‘half’ Moon, which is the lowest Last Quarter Moon of the year. Earthshine, (the faint glow on the night hemisphere of the Moon caused by reflected sunlight from the Earth), may be seen during the evenings on the dark hemisphere of the waxing crescent from the 7th to the 13th. Mercury may be glimpsed at the very beginning of the month, when it sets just less than two hours after the Sun in the western sky. It would be a good idea to try to locate Mercury using binoculars in the bright twilight. At 19h00 on the 1st of the month, it lies 5°above the west point of the horizon and may possibly be glimpsed with the unaided eye as a star-like point shining at magnitude -0.08 in the constellation of Pisces. The planet then moves rapidly in towards the Sun and reaches inferior conjunction on the 15th. Afterwards, it moves into the morning sky but will not be seen due to its very low altitude in the bright twilight before sunrise. Venus rises at around 05h40 at the beginning of the month, a little over one hour before the Sun, and so must be looked for in the brightening eastern twilight. On the 1st of the month, if you look towards the SE, just before 06h, you may see three planets and the Moon in line. From left to right, the order is Venus, Saturn, Moon and Jupiter. There is a fourth planet between Venus and Saturn, but it cannot be seen because of its faintness. This is the planet Pluto. (I like to think of this as the ninth planet of the Solar System.) On the morning of the 3rd, the crescent Moon lies 4° to the SE of Venus, but unless the horizon is clear of clouds and haze, you may not see the Moon. The best time to look is at 06h05 when the Moon is just above the horizon and Venus to the upper right of it. During March, Jupiter shines resplendently in the morning sky. The Planet, which lies in the constellation of Ophiuchus, rises just after 03h on the 1st; however by the end if the month, it rises at 01h30. Although the planet is low in the sky, it nevertheless shines steadily like a beacon when it clears the horizon. On the 27th, there is a close conjunction between the almost Last Quarter Moon and Jupiter, when at 03h00 the two are separated by just one degree of arc (two moon widths); perhaps the most beautiful celestial spectacle this month. Remember to look for the four Galilean satellites through firmly fixed binoculars as they change position from night to night. Saturn rises two hours before the Sun as the month begins and three hours before sunrise at the end. 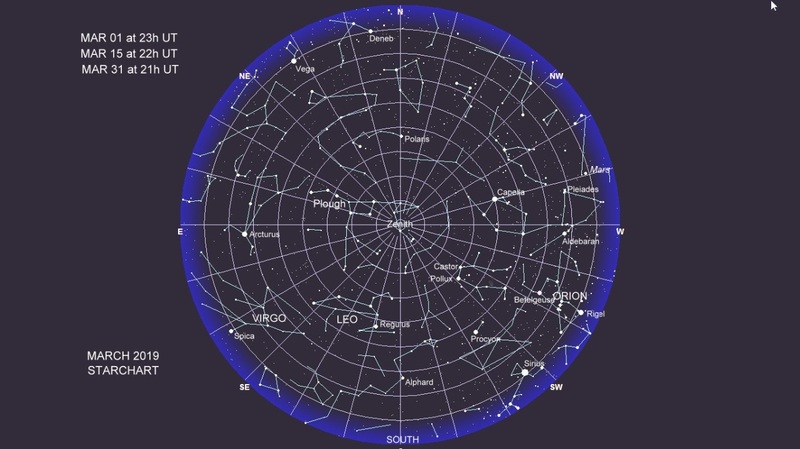 The planet still lies at a very low altitude for northern observers in the southern constellation of Sagittarius, where it remains for the rest of the year. The northern surface of the rings is still tilted favourably towards us and the planet has a pleasing appearance through a small telescope. The waning crescent Moon may be seen approaching Saturn on the morning of the 1st, when Saturn lies 5° to the east (left) of the Moon; the following morning (the 2nd), the Moon lies between Saturn and the brighter planet Venus. The magnitude of Saturn at this time is +1.26, but that of Venus is greater, at -4.01. Uranus is on the Aries/Pisces border and shines at magnitude +5.87. The star omicron Piscium (Trocularis Septentri), of visual magnitude 4.26 lies just under two degrees below Uranus. Mars lies some 10° to the north east of Uranus, more centrally placed in Aries. For the path of Uranus, go to the Remote Planets page accessible via the Menu. Neptune, in Aquarius, is now lost in twilight and is in conjunction with the Sun on the 7th, so will not be available for observation this month. Constellations visible in the south around midnight, mid-month, are as follows: Leo, the western part of Virgo, Crater, and Hydra. The Plough (Big Dipper), which is part of the constellation of Ursa Major, the Great Bear, is at the zenith, directly overhead. 2019 03 11 05:29 Simultaneous transits on Jupiter: two satellites. 2019 03 18 05:32 Simultaneous transits on Jupiter: shadows of two satellites.